Joanne Fluke's cozy Hannah Swensen mysteries have one thing in common with Janet Evanovich's Stephanie Plum books. Neither character can decide between two good-looking men. And, after eleven books, it's time that Hannah made a decision because it's getting a little old. If Hannah doesn't make a decision after the events of Cream Puff Murder, she's not very bright. Hannah is the owner of the Cookie Jar, a bakery in Lake Eden, Minnesota. But, her lifestyle is not conducive to a petite figure, so she discovers she can't get into the Regency style dress her mother, Delores, would like her to wear for her book launch party. Together with her sister, Andrea, Hannah starts working out every morning. When Ronnie Ward shows up as the fitness instructor, though, it's not a pleasant workout experience. Ronnie Ward works as a fitness instructor at a local spa, but also at the police station, because Andrea's husband, the local sheriff, hired her back when her engagement fell through. Unfortunately, Ronnie is the town flirt, and most men in town are caught in her snare, while the women detest her. That's obvious when there's a fight at the local pizza parlor, where Ronnie holds court until she's attacked by a police officer's mother for messing with his marriage. Ronnie is probably the most hated woman in Lake Eden. But, it's the men who are the suspects when Hannah finds her body in the spa's jacuzzi. And, some of those men are police officers, including Hannah's off and on again boyfriend, Detective Mike Kingston. Since the police are suspects, it's up to Hannah, her sisters and friends to find a killer. Fluke's mysteries are always fun, and, after eleven books, familiar. For those of us who read the series, it's comfortable to return to the characters. Hannah's cat, Moishe, usually provides a light touch of humor. And, of course, there are the delicious sounding recipes. But, darn it anyways. Hannah has two choices. She can pick the good looking police detective, Mike, who is a flirt, and doesn't treat her right. Or, she can pick Norman, the dentist, who built a house for her, cares for Moishe, and helps her investigate murders. Give readers a break, Hannah, and make the smart decision. Cream Puff Murder should have made the decision easier. Joanne Fluke's website is murdershebaked.com. 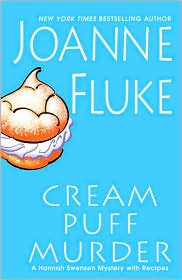 Cream Puff Murder by Joanne Fluke. Kensington Publishing Corporation, ©2009. ISBN 9780758210227 (hardcover), 288p. I have yet to read a Joanne Fluke mystery, but she is certainly an author on my radar. I just don't how you can wrong with the combination of mystery and food. How would you compare Fluke to Diane Mott Davidson (another author who has been recommended, but whom I have not yet had time to read)? Would it bother you if I said about a food mystery, that it's a matter of taste? (grin) I'm a Fluke fan, rather than a Davidson fan. It truly is a matter of taste, though. Davidson's books aren't quite as cozy. Her character, Goldy, has an abusive ex-husband, and he's a returning character in many books, and a returnign issue in all of them that I read. There are good-sounding recipes that are logically inserted in the mysteries because Goldy is a caterer. Fluke's books have a little more humor, the long-running relationship with Hannah and her two boyfriends, and more of a small-town flavor. Hannah's mother and sisters are involved in her cases, and her mother is an demanding character. I'm afraid you really do need to read one of each to decide which you prefer. Fluke's books are definitely cozier. I can read either type of book. But, there's something about the Davidson books, perhaps the abusive ex-husband, that never appealed to me. So, I've read a couple, but I've read all of Fluke's books. Well I was hoping that Hannah would make her decision in this book (I haven't read it yet), but according to your review it looks like she hasn't. I agree it's time to make a decision. Thanks, Janel! You and I feel the same about Hannah's choices. And, I agree these are the two best culinary series. They do the best job in incorporating the recipes into the storyline. Thanks for your comments. I hope they help Molly make a decision. I'm afraid the second last book is going to leave you frustrated with Hannah. Cream Puff Murder seems to push her a little more in one direction. Let's hope! I absolutely LOVE culinary mysteries! I enjoy reading Joanne Fluke and Diane Mott Davidson. yeah Hannah, just throw the two names in a hat and pick one ! Or let the cat choose, he certainly seems to run her life as it is. Sheeesh to wishy washy women! Enough, already! Yes, - these comments help a lot! I already have one Mott Davidson novel (I believe it is Tough Cookie)- given to me by someone quite some time ago. I will search for the first in Fluke's series and begin with that one. I think my taste will probably closely align with yours. Mel, I enjoy the culinary mysteries, as well as some of the craft ones. Both authors do nice jobs with the culinary aspects. Frankly, Kaye. I think Moishe, the cat, has his favorite, but Hannah isn't paying attention. She certainly should after this book. Try them. Let me know what you think when you've read one of each. I actually enjoy both the Davidson and Fluke series. Hannah drives me nuts with her indecision, and I think it's highly unlikely that Mike and Norman would be friends and tolerate her wishy-washiness with such good grace. And if she STILL makes the wrong decision after Cream Puff, I may have to write an angry letter to Ms. Fluke :) Though the Blue Blueberry Muffin recipe makes up for a multitude of sins. I'm with you, Allison. After that book, there is no reason Hannah shouldn't make a decision. You're right. I can't see that the two men would be friends. I hadn't thought of it that much, and I should have for the review. Thank you. Go for it! I hope Joanne Fluke knows that it's time for Hannah to make the right decision. oh - this is the first review I've read of this one. Glad to hear this was a good one, even if Hannah still can't decide on a man (I wish she would though). I've personally made several of the recipes in the book and they are always good...one of the things I look forward to are new recipes! It was a good one, Kris, but if Hannah doesn't decide after the events of this book, I quit. I'll just pick up the books then for the recipes, or get them off the website. So, she has one more book, for me. The story and characters are well-written, with a heaping tablespoonful of self-deprecating, yet gentle humor. There's just enough mystery to keep things boiling, and the ending is a cheering bite. I like those comments - "a heaping tablespoon" and "a cheering bite". Very nice! Thanks. I like the Hanna Swenson books, love the recipes, and wish she would pick a guy! Maybe she will one of these books or maybe one of the guys will bow out of the picture. My sister is more up-to-date on this series than I am. I gave up because I'm frustrated with her lack of decision. There has been a major switch with this last book, however, it wasn't one I'm crazy about. So, I don't think I'll be picking it up again.